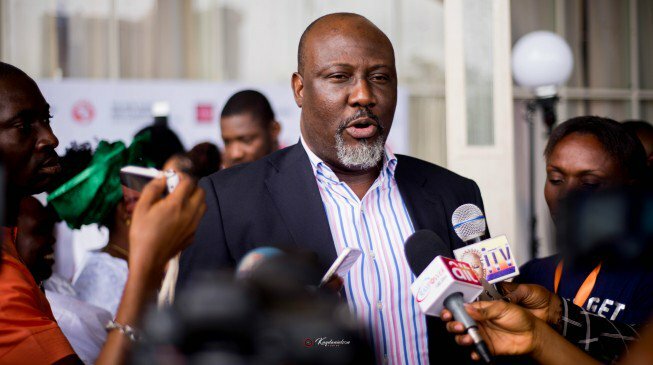 The Nigerian Immigration Service (NIS) has confirmed the arrest of Dino Melaye, senator representing Kogi west. Melaye was arrested at the Nnamdi Azikiwe International Airport, Abuja, on Monday morning. The lawmaker was on his way to Morocco at the time security personnel accosted him. In an interview with NAN, Sunday James, spokesman of the service, said Melaye was arrested by immigration officials “based on instruction”. The senator had denied the allegation, saying it was politically motivated. On March 1, Melaye was stranded at a high court in Maitama , Abuja, after the police attempted to arrest him. He had earlier been arraigned Melaye for allegedly framing up Edward Onoja, chief of staff of Yahaya Bello, governor of Kogi state. The senator was accused of deliberately giving false information to the police that Onoja was involved in an attempt to assassinate him. But the court granted him bail in the sum of N100,000. However, operatives of the special anti-robbery squad (SARS) prevented him from leaving the court premises. He later sneaked out, saying angels came to his rescue.